Mail-chimp is our prefer ed email engine. Use the login information provided by Safe News letters to access your account. Press login and you will be directed to the mailchimp dashboard. Easy! You DO NOT need to import a list… we have already done that for you. We configured all the “thank you” emails too. You DO NOT need to setup your school template… we have already done that for you. Pro Tip: Have your typed email newsletter already prepared. It’s an easy copy and paste during the send process! Every time you send a newsletter (email) you will need to create a new campaign. 5. Add in all the necessary information. !! DO NOT change the email address !! 7. Paste in (or type in your email to parents). Include any links in the email. 8. On this screen make sure everything is OK and click send. Your email will be sent to all list recipients! Yay! Sometimes parents will call the school and request that they be added to the newsletter subscription list. In most cases you will direct them the school website where they can fill in their own details. Sometimes its more practical to add them yourself. After clicking submit, the parent email address will be inserted into your newsletter subscription list. The parent will be automatically sent an email telling them that you have subscribed them to the list. SMS is now being used by schools to capture student absences. This cuts down the morning phone time used by office staff and allows them to deal with “face time” with parents, teachers and students. Schools are busy places, especially between 8.30 am and9.30 am in the morning .. and especially for office staff. This is when students and teachers are arriving, parents are coming and going and the phones are ringing. There are several specialized companies on the market which enable virtual mobile phone numbers. If you are familiar with TV shows like Australian Idol or Big Brother you will be aware that voting is often done via SMS where people sitting at home watching TV can vote. The phone numbers provided are virtual phone numbers. This means that the numbers are set up for the sole purpose of incoming messages only. This sort of infrastructure is EXPENSIVE. Price alone rules out most schools for using something like this. How the Safe Newsletters SMS Absence system works. To reduce costs for schools, Safe Newsletters uses a work around yet still implements a fully functional SMS system. SIM Only plan from a telecommunication company such as Optus or Telstra. Amayasim offer very cheap SIM only plans. Mobile phone is NOT necessary. Safe Newsletters SMS enabled PRO account. Charges apply to each SMS a parent sends you. Telecommunication companies these days offer a SIM only plan. In other words you can buy a SIM card without the phone. SIM only plans come in different flavours but essentially you purchase the SIM card and NOT a phone. You DO NOT need an expensive SIM only plan. Because you will be using it for incoming SMS messages ONLY… an expensive plan is NOT necessary. In fact a $10 per month plan will suffice. Essentially there are 2 types of SIM only plans. A post paid plan is a contracted plan over 12 or 24 months at a fixed price plus call costs once the included cap is reached. If there are no outgoing calls then the total cost of the SIM card would be $120 per year on a $10 per month plan. This could be automatically paid using the school corporate credit card. Activate the SIM card. Often this can be done online. Use the SMS mobile phone number that comes with the SIM card and distribute this number to your parent group. Encourage your parent group to use the mobile number your provide them to SMS student absences. Have a look around and get some advice from your local mobile phone dealer and ask about SIM only plans. Amaysim seem to be the cheapest and most flexible with their SIM only plans. If school office staff need to reduce phone time and increase face time then a student SMS absence solution might be worth considering. Shop around for a good SIM only SMS phone plan. Call Safe Newsletters and find out if a SMS solution is cost effective and good fit for your school. PLEASE NOTE: SMS must be enabled on your Safe Newsletters account. Enabling SMS is optional. Please notify us if you need SMS enabled. Charges apply per SMS. Once SMS is enabled on your account, parents also have the option to receive an SMS from the school. Parents can add their mobile phone number and then select the SMS option. Newsletters are sent in the usual way, except this time the parent will also receive a SMS notification as well. This is all silently processed and sent in the background and there are no further steps required when uploading and sending your school newsletter. SMS provides an extra layer of convenience, connectedness and provides parents with multiple modes of communication. The new SMS broadcast feature will send and SMS to ALL parents, students and teachers who have subscribed to your newsletter. A standard SMS is 160 characters which is billed at the cost of one SMS. More than 160 characters means that the message will be billed as two messages. This is the real power of the Safe Newsletters SMS system… the ability to send SMS to small groups of parents. This method overcomes 2 problems. 1. Can I add all students and phone numbers to the Safe Newsletters system to make it easier? My answer? You DO NOT want to do that because then 2 systems will need maintenance. Your school system and then hypothetically the Safe Newsletters system. (We could easily install a facility like this… but we deliberately avoided this) In the end it won’t be easier… because 2 systems will be more work. Data duplicity will be created and you will have data overload. Avoid this at all costs. Its always best to have one source of truth ie your school management system. 2. How do I bulk add phone numbers? My answer? For sending to small groups of parents, use your school system and export parent mobile phone numbers. I call this disposable data or single use data. Simply copy and paste them into the box for mobile phone numbers (see image above). This will reduce workload and reduce the risk of data errors in duplicate data sets. EVERY school management system has export functions. This is where data is exported into a spreadsheet for you to use. You may not have done this before and it may seem complex but its not. It doesn’t take long to learn how to do it… and when you have done it once… its actually very easy. You will then wonder why you hadn’t learnt this sooner because there are many instances in a school where disposable data is very very handy. Ask to have SMS enabled. Schools pay per each SMS sent. SMS auto sent when newsletters are uploaded and sent. Target smaller groups of parents by using disposable data. There are many good reasons why school newsletters presented as HTML (hypertext markup language) ought to be your preferred newsletter method. HTML is hypertext markup language. In other words… its the language (some call it code) used by web browsers to present text, images and video on a screen. You DO NOT need to know HTML to actually use it. Here’s an example. When an email is sent, it is usually typed into a box with a text editor above it so that text can be made bold, underlined, change color, change font etc. This is a HTML text editor and your email is sent as an HTML email. Its a bit like driving a car. You don’t necessarily need to know how it works to drive it. HTML is the same. Traditionally schools will type their school newsletters in MS word (or something similar) and then save it to a PDF and then place it on the school website. This is still a good technique. But PDFs are not always convenient or practical. PDF’s are sometimes very impractical to read on smart phones and tablets. With more and more people using tablets and phones to collect email and browse the internet, PDFs DO NOT always fit into the screen properly and it becomes difficult to read. You may have experienced this yourself. Some web browsers need special PDF plugins for the newsletter to display properly. For some parents this can be problematic if they don’t know ho to install the plugins on their web browser. In most cases the plugin installs automatically… but sometimes it doesn’t. Sometimes the PDF might be too wide for the parent computer screen in which case they need to scroll across as well as scroll down. Sometimes the parent PDF reader may be out dated and cannot read the school newsletter. Sometimes the PDF can become corrupted and unreadable. Sometimes PDFs can take a while to load. The whole premise behind making your school newsletter available online is cost effectiveness and convenience. PDFs are not always convenient for everyone and as such the school newsletter may go unread. This is exactly what we want to avoid. HTML on the other hand will always render in an internet browser without special plugins. 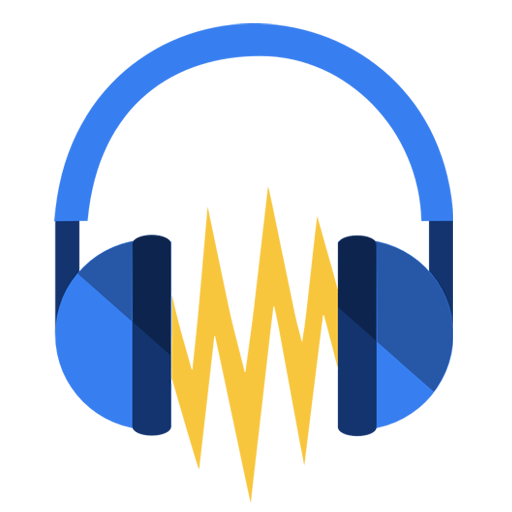 Modern websites are built using a responsive deign, meaning that that the website can detect the dimensions of the parent computer monitor, phone or tablet and re-size itself accordingly. Even if the website is NOT responsive, HTML will always render itself without the issues of PDF plugins. HTML loads quickly because the file is significantly smaller. HTML is robust and versatile because the modern internet was essentially conceived using HTML. Save it. This is your backup copy. DO NOT add photos to your MS word document. This is done later. Once finished typing your newsletter, select all the text in the document and copy it to the clip board. Open your website content management system (CMS) and create a new page or post. Often the CMS with have a button in the text editor to copy from word. Click this and paste in the text you copied from your word document. This will convert your word document text to HTML and insert into your new page or post. Sometimes there may some minor formatting issues (such as extra line breaks) which can be simply cleaned up . Images can now be added using the image button in the text editor. Safe Newsletters provides an inbuilt text editor to convert your newsletters to HTML. Once the newsletter is complete, Safe Newsletters then provides the functionality to broadcast it to your parent email list in only a few clicks. There is no need to save the newsletter to your website either. Safe Newsletters can automatically display it on your website straight after you have sent it via email! Therefore, there is no more MS Word to PDF conversion and no more PDF uploads and less website maintenance. We expect that the HTML method will be widely used. If you would like further advice or functionality added, leave a comment below. Get ready for the 2013 academic school year by optimising your safe newsletters account. Its easy to do and only takes a few minutes. I trust your you are refreshed from a well earned break. I hope Santa was good to you! If you do this NOW, it will help you streamline your parent communication and reduce errors throughout the year. CHANGE YOUR PASSWORD. We take security very seriously. Whilst you were on holidays, we have taken further steps to make Safe Newsletters even safer. BUT… your password is still the gateway to your entire parent list. It would be horribly embarrassing if someone managed to guess your password and access your account and then start sending inappropriate messages. If you need a password generator, have a look at this online password generator to generate a secure password for you. If you use this, please DO NOT use the punctuation function… Safe Newsletters won’t allow SOME punctuation in passwords. SMS. If you would like to add a SMS function as an extra layer of communication for your parents, we can now enable this for you. When your newsletter is sent, a SMS will also be sent to parents. It operates on a consumption basis. At the end of each month we send the school a bill for SMS consumption. Parents are given the option to receive the SMS. More information here. PRUNE your parent email list. If parents haven’t collected their newsletter for 120 days, you can prune the list which effectively deletes their email from your list. This keeps your list nice and tidy. ADVERTISING. If your school has advertisers that wish to advertise in your newsletter for the whole year… you now have the option to include their add alongside your newsletter. The add sits beside your newsletter on the computer screen. This way you don’t have to include it in your newsletter each week. We take care of all the electronic advertising. We have more information for schools here. Send all your advertisers here for more information. MOBILE DEVICES. We have a new HTML newsletters feature that allows schools to publish their newsletter as a web page rather than a PDF document. This way the HTML newsletter will render in mobile devices such as smart phones and tablets. Sometimes PDF documents are difficult to read on smaller devices because parents need to scroll across as well as scroll down the screen. HTML newsletters eliminates this issue and makes the reading experience much friendlier. ADD EVENT REMINDERS. Add your school events and reminders to Safe Newsletters which allows parents to auto add them to their Outlook (or similar) calendar. This way parents are well informed of upcoming events and dates. SURVEYS. Don’t forget you can add surveys to the email that is sent to parents. Why not survey parents and ask them if they would like to receive a SMS each time the newsletter is published?? Competition winners will be announced soon..
Have I missed something or need some advice on something? Leave a comment below. Before we start… we are offering a free professional version subscription to Safe Newsletters. Offer expires December 30 2012. See detail below. There are lots of ways to send SMS alerts to parents. The most rudimentary way would be to use a mobile phone, type the SMS, enter the parent phone number and then send. Of course this would take a while if you had lots to send. One could speed it up a little if all parents were grouped into a distribution list. A simple Google search for free SMS will yield a ton of websites offering free SMS. Often there will be a very small daily limit and often it will have a tag line advertisement at the end of the SMS. Skype is another way to SMS. Simply buy some Skype credit and you can send SMS from your computer. However, Skype does not offer a bulk send feature. Once again this is time consuming. Whilst research shows that 95% of all SMS are opened in the fist 5 minutes which proves that messages actually are received and read… it’s just another thing schools have to do in an already crowded technology environment. The trick is to silently automate SMS so that it becomes a natural part of the school work flow. SMS is a key part in school communication these days. There are many useful ways in which SMS can be used in schools. The most obvious way to automate SMS is to integrate it into your school management software. A fully featured integration would allow schools to send SMS and drill down the broadcast to only those parents whom the message is relevant. If the message goes to all parents but the message really only affects a handful of parents, the power of the message becomes diluted. Over time your SMS becomes a hindrance rather than a powerful message and thus becomes a waste of time and money. ALL school management systems (and I mean all systems) have the ability to export custom data to a spreadsheet or text file. For instance. Lets say you only wanted a list of all parents who had not yet paid for the year 5 camp. Your school management system would look up those parents. During the lookup you might have the system add the parent mobile phone number too. I call this disposable data. Its data that is used for a purpose and then deleted. If you don’t have a fully integrated SMS system, this disposable data becomes extremely useful because it forms a “data bridge” to a secondary application that has the capability to send the SMS to targeted parents. Secondary applications are nothing new. I consider MS Outlook a secondary application because it’s not my main data store. I export email addresses from my main data store and then use MS Outlook as the tool to send the email I have exported. Safe Newsletters is one of these secondary applications that can be used to send SMS using bridging data. Disposable data exported from your school management systems can be copy and pasted (yes as simple as that) into the Safe Newsletters SMS module to send highly targeted messages to parents. Safe Newsletters isn’t just a newsletter application… it’s a very powerful communication platform capable of much more than newsletters, surveys and permission forms. Safe Newsletters are offering one FREE 12 month professional version subscription to a school in each state and territory of Australia. Tell us why you would use SMS and how it would benefit your school. Use the comment box below. 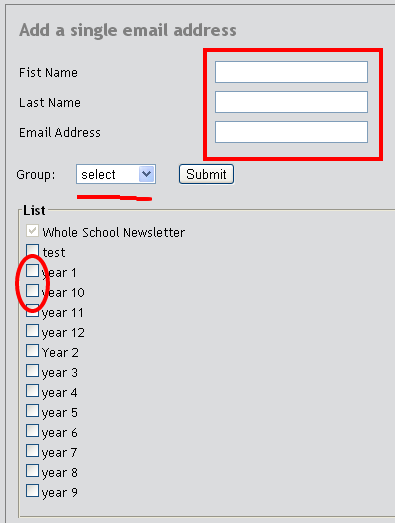 Make sure you use your school email address and add your school website in the fields when prompted. We will contact you if your school is chosen. Make sure you Follow the Blog via email by adding your email address to the form on the right…. Damon Taylor is Director of Safe Newsletters and has a long history of making data more useful for schools. Schools are great at duplicating data when it’s not necessary. Schools don’t do this for fun, its most often because they don’t fully understand what they have. I’m often asked to add new features to Safe Newsletters. I find this exciting because its takes the existing platform and makes it better. Sometimes I’m asked to add features that are crazy complicated. These just take a little more time. Then I’m asked to add features that schools already have. I call this data duplicity or data overload or data for the sake of creating data. Here’s some good examples just in the last few weeks. A principal emailed me the other day and loved the Safe Newsletters system. He wanted me to add a feature where student names could be added alongside the parent name, email address and mobile phone number. He went on to say that it would be convenient if he could email parents but identify them by the child. Some parents have different surnames etc… What he didn’t realize is that the short-term convenience would be a long-term black hole. The school already had a student management system where parent and student data was stored. The system would search students and show parent names as well. It also showed the parent contact details as well as their email address. Duplicating the data would mean that 2 systems would need to be updated and maintained. Students would come and go. Email addresses would change. All changes and updates would need to be done twice. The school management system can do the job with out the need for a second system. Where data is concerned, always try to use a single data set. It avoids errors and saves time. Make sure you always back up you data too! A school wanted to streamline their cash flow. They felt that emailing parents requesting payments for things like school excursions and the like would decrease the number of overdue payments. They wanted all students loaded into Safe Newsletters along with their parent names and email addresses. The school wanted to sort students into groups and then email their parents requesting a payment for an excursion. Again … its data duplicity. The school already had this information in their school computer system. All that was needed was a way to export the data so that its useful. This is the key part. Extracting data so that it can be used in other applications where that data is working for you…. not the data working you. In the end the school saved themselves a lot of time and effort. They were able to extract the data they needed which then became a very simple copy and paste into Safe Newsletters to send the excursion information to parents. There were no long-term maintenance issues, parents paid on time and they saved themselves a lot of work. Each state government has a school management system installed in all their schools. Non-government schools use systems purchased from vendors specializing in school management. ALL systems both government and non-government, have ways to export data sets with only the data you need from the school management system. If you don’t know how to do this, just call the support phone number for your school management system and ask. You may find that there is a button somewhere that will make an export super easy. When you know how to do this, your data becomes infinitely more useful. Most systems will export the data into a spreadsheet where you can then delete the data you don’t need. Save the data to a place where you can find it. Where possible, always work from one set of data. Data is scary dangerous if you have too much. Use disposable data. This is where a data export is used once to do a job. Often the data goes out of date (eg students move schools and their parent email addresses is no longer needed). The data is used and then deleted. The data is exported again when the time comes to run the job again. Think about how your existing data can be used WITH applications rather than duplicating data FOR an application. Before you commit to buying data tools… be sure they are compatible with your existing data. ALWAYS be security conscious. Data can be scary dangerous in the wrong hands. Be maintenance conscious. Who will maintain your data sets? Save time. Ask yourself if what you are doing will make more work in the future. Save money. Ask yourself if what you are doing will cost you more money in the long run. Damon Taylor is director of Safe Newsletters and has been working with school data for many years to make it more useful, more reliable and more secure. 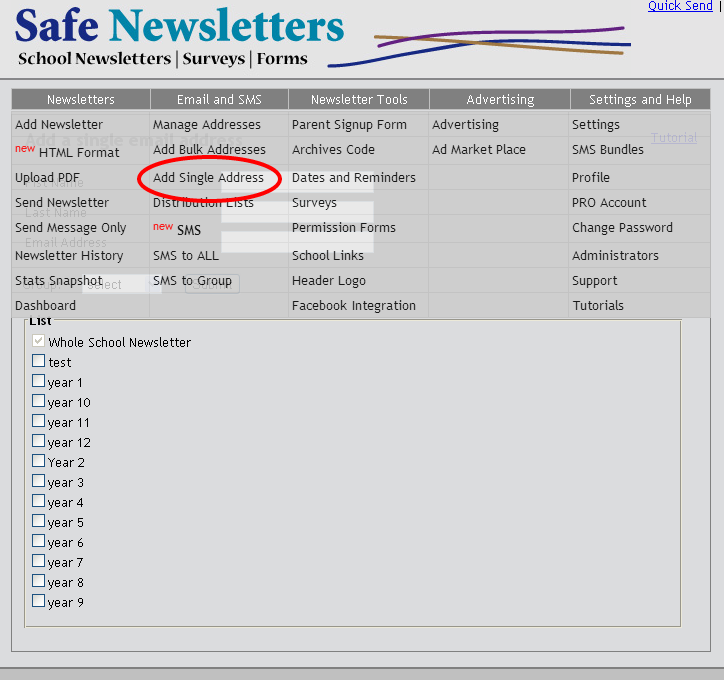 Safe newsletters was initially set up for email. As such, parents were not required to add a mobile phone number or a password. 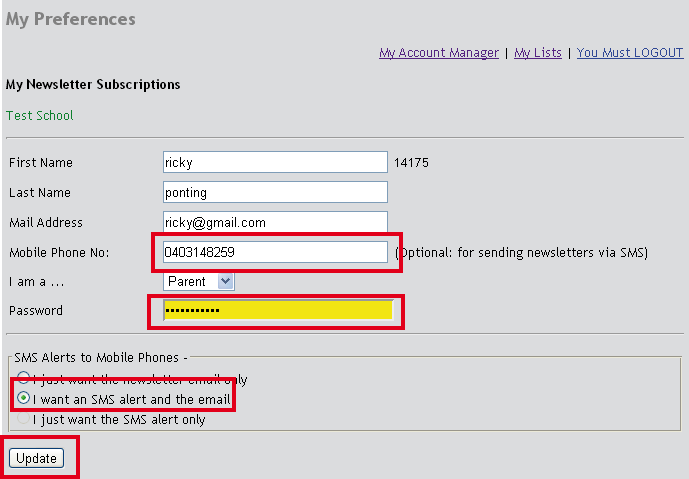 We have added a new parent login section so that mobile phone numbers can be added. So we need to give you a temporary password. To get you temporary password, you need to click the “Manage My Preferences” link at the bottom of the newsletter EMAIL you receive from the school. When you click this link, a new new temporary password will be emailed to you. Using your mouse, highlight the ugly password, right click and copy it. Then in the password field, paste in the ugly password you copied from the email. Next to the school newsletter subscription you want to update, click “Manage”. Add you mobile phone number. Just add numbers without spaces, brackets etc…. Just add one big long phone number. Choose the SMS option you want. Once you have done this and your school has enabled SMS, you will receive a SMS once your school newsletter is ready for collection. Is Your School Newsletter Illegal?